Former Los Angeles County Undersheriff pleads not guilty to corruption charges. Asians behaving badly... jail abuse scandal edition! 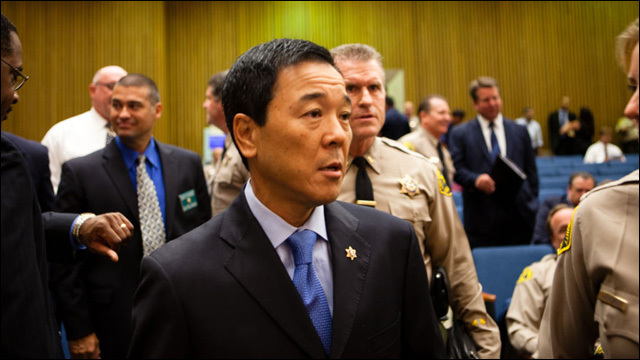 This week, former Los Angeles Sheriff's Department Undersheriff Paul Tanaka was indicted on federal charges of obstructing an FBI investigation into brutality and corruption in the Los Angeles County jails. Tanaka and former Los Angeles Sheriff's Department Captain Tom Carey pled not guilty to the charges in magistrate court on Thursday. They are two of 22 current or former LASD officials charged in an ongoing federal probe into corruption and civil rights violations by guards at two downtown facilities. Prosecutors say Tanaka and Carey were aware of rampant abuse at the jail. They are accused of directing a group of deputies who were convicted last year of carrying out the plot to impede the FBI investigation. Tanaka and Carey, both 56, are the eighth and ninth LASD officials to face criminal charges related to the obstruction of an FBI investigation into corruption and abuse of inmates at two jails, including Men's Central Jail. In 2011, inmate-turned-FBI informant Anthony Brown was hidden from his FBI handlers. Brown was booked and re-booked under a series of false names, moved to multiple locations and eventually told by sheriff's officials that the FBI had abandoned him. "Tanaka and Carey are accused of overseeing efforts to thwart the criminal investigation, so that the criminal investigation could not shine a light on the civil rights abuses that were occurring in the jail," Yonekura said. Seven now-former LASD deputies, sergeants and lieutenants were convicted last year for their roles in the operation. All seven argued they were only following orders from their superiors. They were sentenced to prison terms ranging from 18 to 41 months and are now appealing the guilty verdicts. Tanaka, formerly the second-highest ranking official in the department, is currently serving his third term as mayor of Gardena. He is expected to ask the City Council for an "excused leave of absence" as he deals with this pesky federal indictment stuff.